At the two sessions of the National People’s Congress (NPC) and the Chinese People’s Political Consultative Conference (CPPCC) last year, the Guangdong-Hong Kong-Macau Greater Bay Area was written into the Chinese Government work report, thereby formally becoming part of the national development strategy. This year, the development plan for the Greater Bay Area will be introduced and implemented, signifying that China’s Guangdong province, the Hong Kong Special Administrative Region (SAR) and the Macau SAR will enter into a new era of collaboration, jointly constructing a world-class bay area. The Macau SAR Government has taken a prominent role in the development of a city cluster in the Greater Bay Area and is actively involved in the central government’s One Belt, One Road initiative (OBOR). Macau aims to make better use of its position as a world centre of tourism and leisure, and as a commercial and trade cooperation service platform between China and Portuguese-speaking countries. This will facilitate the free flow of talent, logistics, capital, information and technologies in the region, and will foster Macau’s economic growth by elevating its role in the country’s overall development. The Greater Bay Area, which includes Hong Kong, Macau and nine cities in Guangdong, is an externally facing economy with dense industrial clusters, first-class cities and extensive transport links. All these characteristics meet the requirements for the establishment of another world-class bay area, following in the footsteps of the New York City Bay Area, the San Francisco Bay Area and the Tokyo Bay Area. According to iiMedia Research online public data, in 2016, the Greater Bay Area’s 11 cities had a total population of nearly 67 million, which is greater than the Tokyo Metropolitan Area – the world’s largest city cluster, with a population of 43 million. However, the Greater Bay Area has a combined GDP of $1.38trn, lower than the $1.45trn of Greater New York and $1.86trn of Greater Tokyo, leaving plenty of opportunity for further growth. The Greater Bay Area has a long coastline, a group of large harbours and an extensive sea area. The economic hinterland is vast, and it is also the meeting point of the Silk Road Economic Belt and the 21st-Century Maritime Silk Road. The shipping and aviation industries are well developed in the Greater Bay Area, which is home to some of the world’s busiest ports and airports. It also benefits from a modern industrial structure, featuring service industries and advanced manufacturing companies. Hong Kong and Macau have already taken a leading role in finance, transportation, trade and tourism. The manufacturing industry is well established and technology has been continuously improving. The Greater Bay Area is uniquely characterised by China’s ‘one country, two systems’ constitutional principle: as part of China, the Hong Kong and Macau SARs are firmly supported by the central government. At the same time, they also retain their own free economies, an open market, a local currency that is (directly or indirectly) linked to the US dollar, simple clearance at the border crossing, and the use of Chinese and English or Portuguese as official languages. China’s OBOR is set to become a global phenomenon, with the Greater Bay Area striving to become its hub of value creation. The area has extensive infrastructure facilities and an advanced supply chain network. In particular, it boasts two free ports (Hong Kong and Macau) and the Guangdong pilot free trade zones (Qianhai, Nansha and Hengqin). The Greater Bay Area aims to build close economic connections with countries along the route, establishing a free trade zone for all economic activities to make itself the most significant hub in the area. The flexible mechanism of ‘one country, two systems’ facilitates international cooperation and promotes the development of the OBOR. Collectively, the free port, the SARs, the special economic zone and the pilot free trade zones provide huge opportunities to expand regional trade and industry. The 11 cities in the Greater Bay Area will compete against one another, but will also complement each other as they enhance global competitiveness. Hong Kong is an international financial, transportation and trade centre, while Macau focuses on the coexistence of different cultures and the establishment of an economic and trade cooperation platform. Hong Kong and Macau have traditionally had close relationships with Commonwealth and Portuguese-speaking countries respectively, which has helped both regions to foster dynamic economic communication. The Macau SAR Government has responded positively to the national strategy for the Greater Bay Area and drafted a preliminary proposal for “the development of a city cluster” last year. It focuses on Macau’s ‘one centre, one platform’ initiative and intensifies the cooperation between Macau and the region’s other cities, speeding up innovation, industry integration and ensuring the Greater Bay Area is unified, open, orderly and competitive. The development of the Greater Bay Area presents new opportunities for Macau’s tourism industry. By taking a holistic approach, the Macau SAR Government continues to enrich its tourism offerings by increasing efficiencies and promoting innovation. In addition, Macau has proposed action plans to strengthen regional collaboration and exploit its distinctive strengths, including a more convenient customs clearance. Macau will strive to become a world-class tourism city, where people can enjoy international standards of living, work, transportation and entertainment. The commercial and trade cooperation service platform not only plays an important role in the overall national strategy, but also fosters the sustainable and diversified development of the Macau economy as well. The platform is expected to be hugely influential for the region and beyond, especially for Portuguese-speaking countries. The Sino-Portuguese Economic and Trade Cooperation Forum, founded in 2003, has successfully hosted five ministerial conferences in Macau and has achieved fruitful results thus far. In 2016, the Sino-Portuguese Cooperative Development Fund was officially settled in Macau. 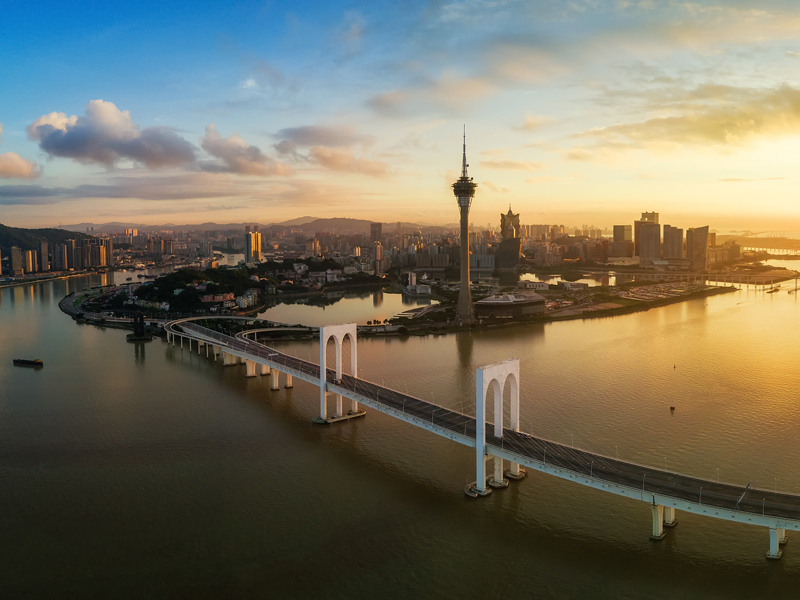 At the same time, Macau is accelerating the development of the region’s financial sector, broadening its scope and actively building a Sino-Portuguese financial service platform to promote the sustainable and diversified development of the economy. In recent years, ‘characteristic finance’ has become a common phrase in the development strategies of regional financial centres like Beijing, Shanghai, Shenzhen and Hong Kong. Following suit, Macau needs to establish its own financial system by adopting characteristics that stem from the area’s unique position as a service platform for Sino-Portuguese cooperation. This will enable it to exploit its distinctive advantages, while avoiding direct competition with its counterparts. In the past 10 years, Macau’s economy has achieved rapid growth that has seen the region become one of the richest in the world. However, the area’s overreliance on revenue from the gaming sector stands in opposition to its sustainable development goals, meaning a new propeller of economic growth is required. Macau has an effective legal administration, a close relationship with Portuguese-speaking countries and huge market potential. It is certainly possible for Macau to develop its finance sector by taking advantage of its unique characteristics, focusing on digital trade, wealth management, equity investment and investment banking. The Macau SAR Government hopes to make use of China’s national strategy, in combination with its own ‘one centre, one platform’ policy, to broaden the scope of its financial industry and create value with regard to asset and wealth management. Regional financial centres everywhere are pursuing fintech, internet finance and the big data economy, but Macau has unique advantages to draw upon when tapping into these new developments. Although Macau is currently dominated by the service industry, and thus its sensitivity to financial reform remains relatively low, the development of its own financial sector will help the region move towards a more diversified economy. In response to the national strategy of the Greater Bay Area and Macau’s aim of developing its own financial sector, ICBC Group will strengthen the strategic positioning of Macau as an important global platform. The group will also support ICBC (Macau) in its management of the group assets of Portuguese-speaking countries. In March 2018, the Macau SAR Government and ICBC Group signed a memorandum of cooperation to support the development of Macau’s “characteristic finance” industry. The goal is to embed Macau and the Portuguese-speaking countries within the growth of the OBOR in order to accelerate the development of Macau’s finance sector. This will also promote the role of Macau in renminbi internationalisation and the development of renminbi cross-border investment and business financing. ICBC (Macau) will take full advantage of ICBC’s brand, technology and resources to boost financial development in the region and support the businesses operating within internet finance, electronic commerce, asset management and wealth management. ICBC (Macau) strives to provide all-round financial services for enterprises, residents and visitors to Macau, to foster the diversified development of the economy and enhance Macau’s international competitiveness and global influence.